I have made the wax cast (which will be ‘lost’ with my lost-waxing). It was pretty successful except it was missing an ear. I just melted down some big-arse candles I got from the dollar store. It does mean that our ’emergency package’ is lacking in the candle department, so we will be sitting the dark trying to open baked bean tins when the next catastrophe happens. but we’ll have a cast aluminium dog’s head to throw at dem alien invaders. The wax cast. Actually kinda cool with a light behind it, despite the photo being out of focus. I melted the wax on the stove top. has a low ignition temperature, around 200-250C. Accidental spillage on the stove heating element would be BAAAD. Spontaneous ignition of a pint of hot paraffin wax bad. I suppose, really, it’s not that different to the risks of deep frying on a stove top (which I would be frightened to do, to be honest). Were I to do it again I’d stick it on (very) low in the oven. Safer. Having melted the wax, I just poured in in my silicone negative and let it cool. 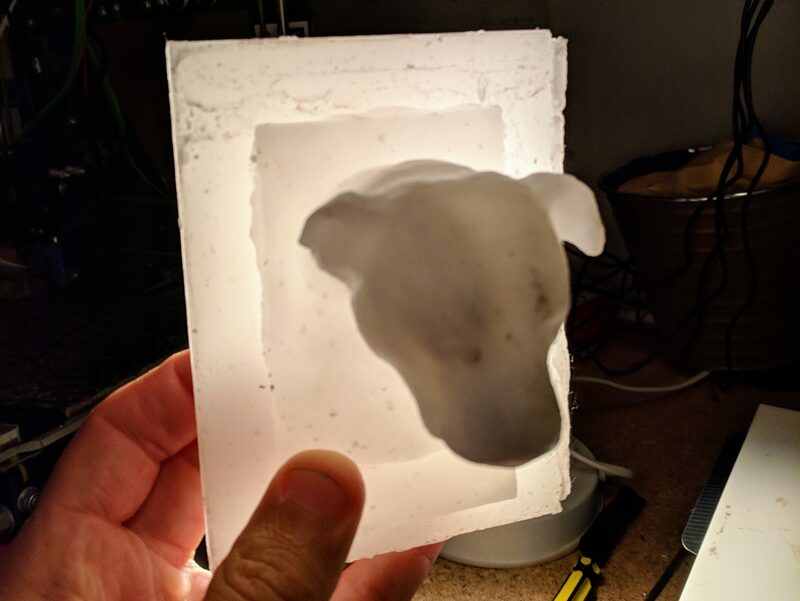 I had returned the silicone into its wooden shuttering prior, so the negative did not bulge with the pressure and heat of the wax (and make my fat-head dog’s head even fatter). Silicone mould on the right. When set (I stuck it in the fridge once it had skinned over), it was pretty easy getting it out of the silicone. I did break off an ear though. Now, from what I have read from the lost wax method you don’t do the whole thing a solid wax cast. You create a hollow shell I suppose by pouring in the molten wax and twirling it around till you are sure you have a suitably thick coating the inside of the negative. In fact, so convinced am I that the swilling-around idea is a good idea*, I am going to do it all again. This shouldn’t really come as a surprise, that the-way-it-has-probably-been-done-since-(pre)-the-bronze-age is a good idea.